Ownership / Access: Currently owned by the Province of Ferrara. Notes: Castello Estense (‘Este castle’) or castello di San Michele (‘St. 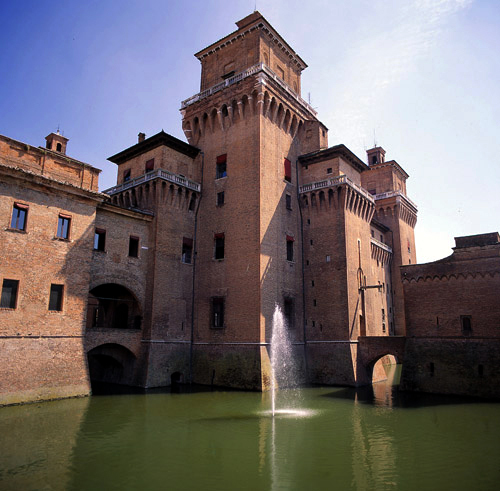 Michael's castle’) is a moated medieval castle in the center of Ferrara, northern Italy. It is a large block with four corner towers.On 3 May 1385, the Ferrarese people, driven to desperation by taxes and flooding that had brought ruin upon them, took themselves to the Marquis Niccolò II d'Este’s palace to ask the advice of Tommaso da Tortona, the high official held to be responsible for this grave situation. Nicolò tried to calm the revolt all day, but by the evening it was clear that the people's spirits were getting more and more angry and that the very safety of the Estensi was endangered. The order was therefore given to summon the disgraced Tommaso, who was given confession and communion and then given to the crowd, who literally tore him to pieces.